Due to an unknown reason, the latest version of GG Commands MXP file takes 4 months to online. I’ve got some negative comments regarding this problem. Sorry for any inconvenience caused. It was unintended. Submitted the MXP file to Adobe Exchange. Status: Pending Admin Review. More than 6 weeks MXP submitted, still pending admin review, contacted Adobe. Adobe Exchange feedback that previous submitted MXP file was unsuccessfully uploaded. Uploaded the MXP again. Status: In QA Process. It has been almost 2 months the new MXP file in QA Process, but it is still not approved. Contacted Adobe again. The GG Commands v2 MXP file has finally been approved by Adobe Exchange, and released. The newest MXP file is now can be downloaded from Adobe Exchange. A single SWF file to generate diagrams for all kinds of guitar chords. Pass a variable from HTML to SWF when loading it. GG Components, GG Tools, GG Commands, GG FLV Player Panel, & GG Book pf2 are available at Adobe Exchange. An Adobe ID is required to login and download components from Adobe Exchange. Registration is free. Installer is distributed as a Macromedia Extension Package (MXP). File > Install Extension, Browse for the MXP file, select the file, and click Install. GG Key Info Panel is a free Flash panel for key reference. 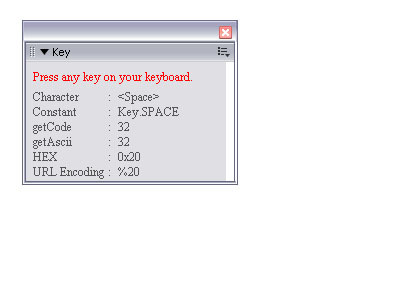 This panel shows key details includes character, constant, keycode, ascii, hex, and URL encoding for pressed key. You can access GG Key Info Panel from Window > Other Panels > Key. GG FLV Player Panel is a free FLV player run as a panel in Flash. 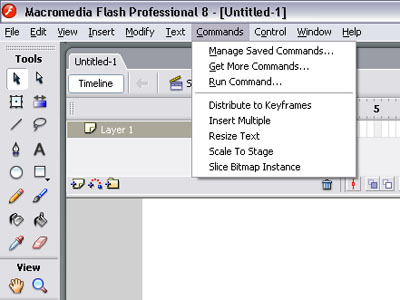 You can preview your flv files directly in Macromedia Flash software without import the flv file. It can load and play any flv located on your local machine or on a web server. You can access GG FLV Player Panel from Window > Other Panels > FLVpp.